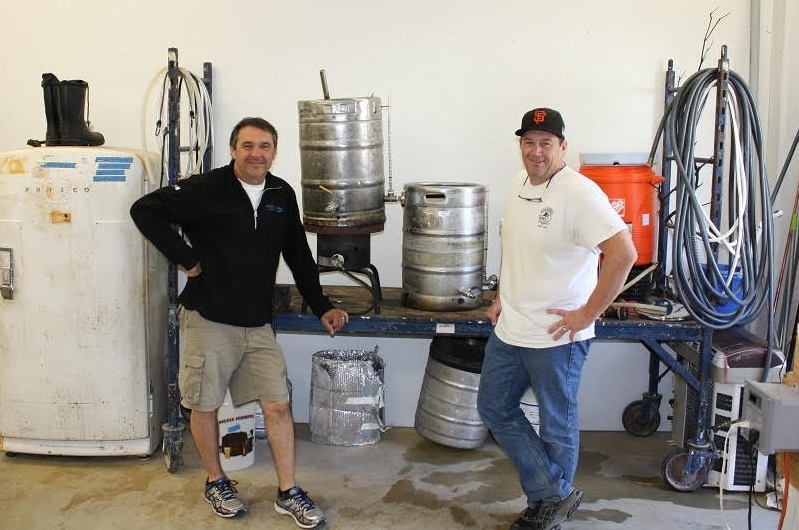 Joe and Matt with their original home brewing kit. Our story begins in the land of sky blue water. Our father, Tom, went to work for Hamm's Brewing Co. after two tours of duty in the Marine Corps. As a result, we spent many afternoons playing in the “Sky-Blue Water Room” at the Hamm’s brewery while Dad worked. We also helped our father at beer festivals and other events where his products were served. Along the way we not only developed an interest in beer, but also learned from our father key lessons about quality, dedication, hospitality, and making customers happy. (Anyone who knows Tom, who may have left the Corps. but still remains a Marine at heart, also knows the phrase “if a job is worth doing, it is worth doing right.”) Our father has also been an inspiration for some of Indian Valley’s beers—Scotch Ale is one of his favorites and we made it in honor of him. Our entry into the beer business began almost exactly fifty years after Dad’s. We initially started brewing as an excuse to get together with our father and six brothers. What began as a hobby quickly became our passion. Now, about five years later, we’re opening Indian Valley Brewing Company. We’re a three-barrel nanobrewery in Marin County offering eight different beers. Our mission is as simple as those early lessons from our dad: to make the best quality beer we possibly can and to make our customers happy.